In a somber town an equally somber man (Nagase) gets off a bus, stranding himself there. He has no luggage other than a strange helmet he carries in its case. It’s not long before he comes upon an elderly shopkeeper resigned enough not to protest when he places the helmet on her head. After some fiddling with its controls the machine awakens for her a long forgotten memory of such happiness that she emerges completely cured of melancholy. His machine starts to get the attention of the residents and an emergency town hall meeting is scheduled. One by one the inventor is able to uncover the wearer’s most joyous memory, pushed aside by years of disappointment and malaise. So distracted are they by this newfound joy, no one stops to wonder why this man is here and what his true intentions are. Through extended point of view sequences we are given access to what the helmet can do. There is a fine line between joy and agony especially when it comes to the effect memory has, something that has been a concern for Sabu since his emergence as an auteur twenty years ago. 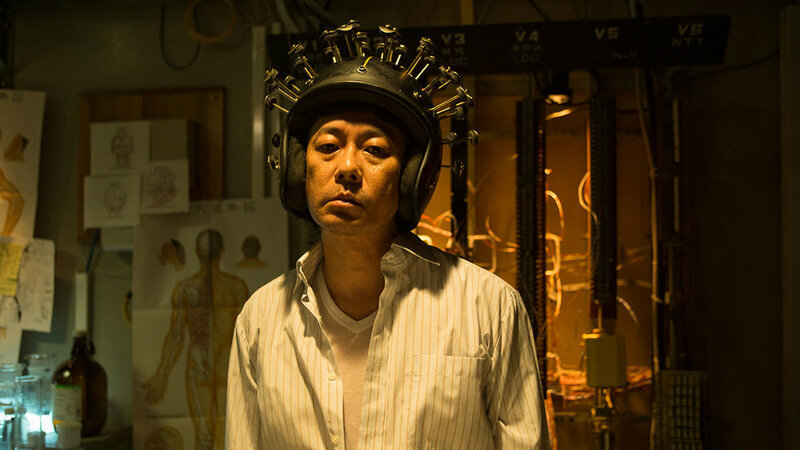 Masatoshi Nagase captivates with his take on the trope of the mad scientist, whose intentions are anything but altruistic. Filmography: DANGAN Runner ('96); Postman Blues ('97); Unlucky Monkey ('98); Monday ('00); Drive ('02); Blessing Bell ('02); Hard Luck Hero ('03); Hold Up Down ('05); Dead Run ('05); Kanikosen ('09); Bunny Drop ('11); Miss Zombie ('13); Chasuke's Journey ('15); Mr. Long ('17).